One down, 29 to go! It’s been quite a while since I last shared a recipe with my readers. I’ve been busy, but my food choices haven’t been very inspiring. August passed by in a flurry of activity – painting rooms, staining our deck, sewing up a storm and attending gatherings with family and friends. In the midst of all this activity, dinner has been simple: burgers or chicken with fresh produce from our favorite local farm, sandwiches or pizza. I haven’t stepped beyond the ordinary much lately, but I did manage to make this barbacoa not once, but twice! This recipe, adapted slightly from Tasty Kitchen, was a fabulous find! 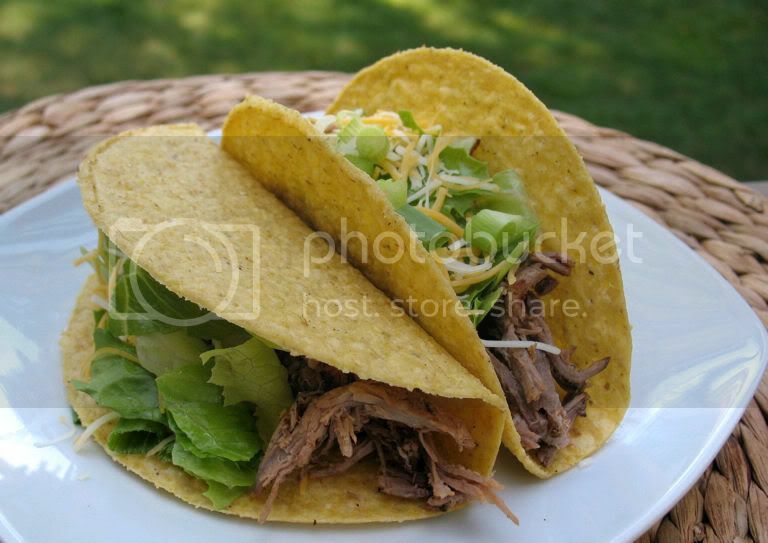 With very little attended prep-time, you can make mouth-watering barbacoa for tacos, enchiladas, burritos or any other favorite Mexican dish. The flavors meld beautifully, but it’s the chilis in adobo sauce the really make the marinade. They impart a wonderfully smoky heat that builds gradually, but consider yourself warned that they can pack quite a punch! 1. Place all ingredients except the roast in a blender and blend until smooth. 2. Spoon some sauce into the slow-cooker so it covers the bottom. Add the roast and pour the rest of the sauce over meat. 3. Cook on low for 8-10 hours. 4. Remove beef from slow-cooker and drain sauce from slow-cooker (set aside – don’t throw it away). 5. Shred the beef using forks or tongs and return to the slow-cooker. Gradually add sauce to shredded beef, stirring as you go. You want to coat the meat with the seasoning, but not leave standing liquid in the slow-cooker. 6. Let beef sit on low or warm for 5-10 minutes to allow the sauce to season the beef.